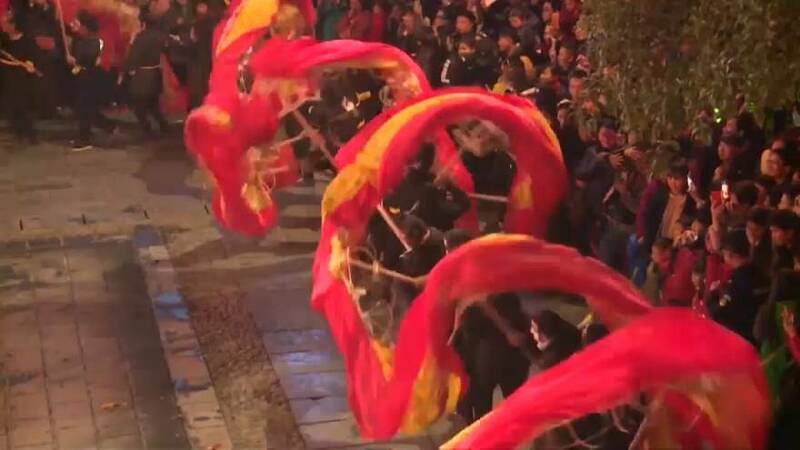 A magnificent fire dragon dance was showcased Friday by the Tujia ethnic group in central China's Hunan Province to celebrate the Winter Solstice -- a traditional Chinese festival. To welcome the shortest day of the year, locals put up a 48-meter long stretch of fire -- the longest in the world, and performed a dragon dance with a 128-meter-long fire dragon, also the longest in the world, in Wulingyuan District of the province's Zhangjiajie City. The fire dragon, made up of a bamboo structure with burning incense sticks stuck all over it, creates two full circles as the dancers go round and round. Over 100 locals took part in different activities, such as fire dragon dance, fire spell, sea of fire and skills of fire. "I am from Sichuan Province. I am very happy to be here in Xibu street. It's very lively, with all the folk customs, festival and all the programs," said a female tourist from southwest China's Sichuan Province. "We are from Guangzhou City. It is our first time to be here. It's very impressive. We saw the fire dragon and bonfire," said another tourist from Guangzhou City of south China's Guangdong Province. The folk activity will last 66 days until Feb. 25, 2018, including fire dragon dance, local drama performance and festival fairs. The activity this time is to further promote the tourism culture and push forward the winter tourism development of the city.